We dress up deviled eggs as little devils after Halloween, on November 2, National Deviled Eggs Day. But around the Easter season, we make special spring chicks because they look so cute cracking out of their shells. Eggs are festive food this time of the year as they are symbolic of transformations. The dead of winter is reborn into the hope of spring; the rising of Jesus from the dead represents new life; yolks turn into yummy appetizers. 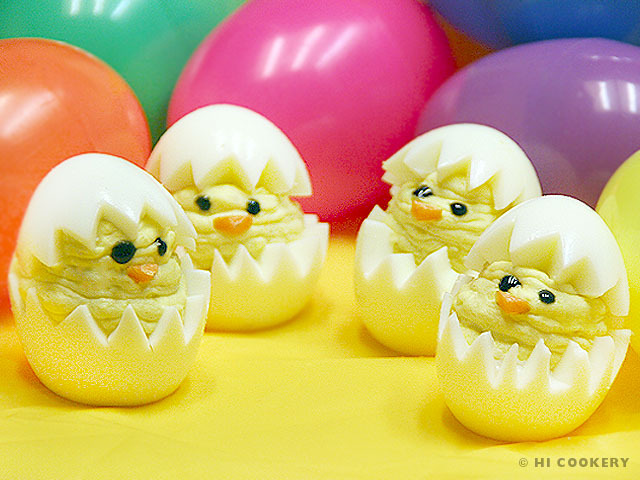 Do deviled eggs differently during Easter Week and decorate them as spring chicks! Blessings to all our blog readers on Easter! Boil, cool and shell the eggs. 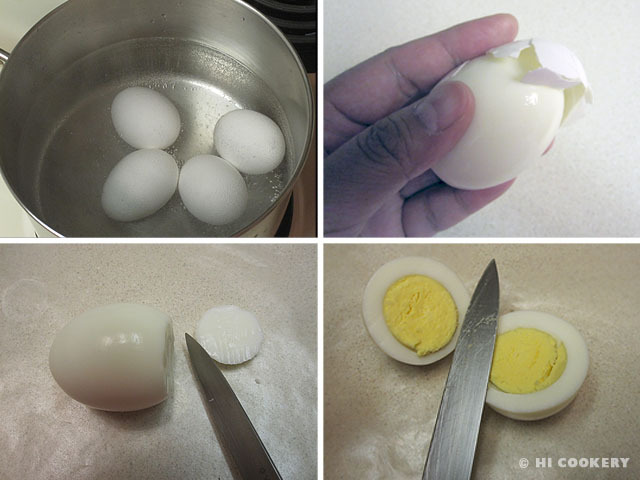 Slice a little piece off the bottom of an egg so it could stand on its own. Slice the egg 1/3 from the top, making the bottom 2/3 larger. Remove the yolks to a mixing bowl. Use a sharp paring knife to cut triangular “cracks” from the top and bottom of the egg whites. Set aside. 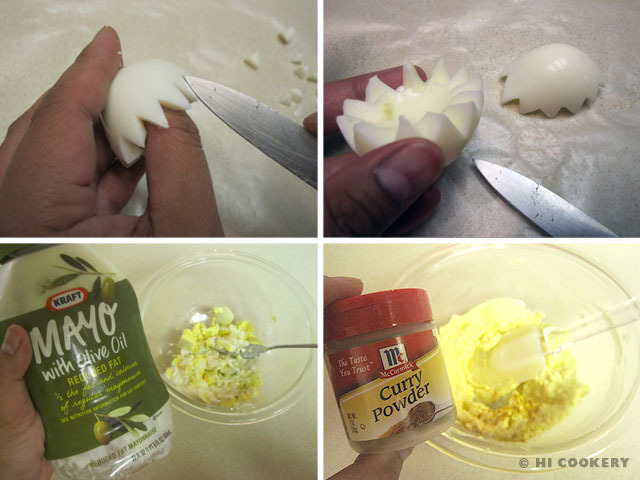 Add mayonnaise and curry powder to the egg yolks and mash with a fork until smooth. Generously fill the bottom of the egg whites with a mound of the yolk mixture (we used a pastry bag fitted with a large round tip). Cap off with the top egg whites. Peel a small part of a carrot. Cut out into tiny triangles for the beaks. Position them on the egg yolks. Lightly touch the tip of the black tube frosting to make the eyes. Refrigerate until ready to serve. 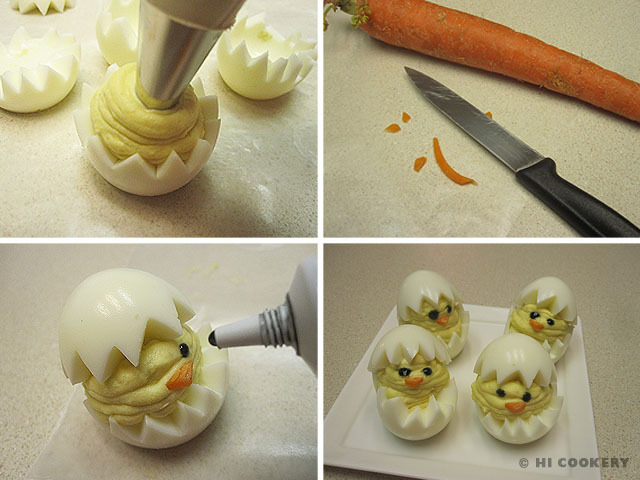 Thanks to Lisa L. for the idea of decorating our deviled eggs into spring chicks. Knead the black tube icing and squeeze out the excess liquid on a napkin before decorating the chick-in-eggs to avoid runny smears on the yolk filling. I found this too late for this Easter but I will definitely do this next year. Cute idea and I love your recipes! Thanks for visiting our blog! We hope to make more cute and festive foods to celebrate special days and holidays.